Diamond Fab called Blue Tide to upgrade from their older website that was not responsive on newer mobile devices. Diamond Fabrication of Durham Ontario is a medium sized welding and fabricating business based in the Durham region. Started by Chris Damianidis in 2004, Diamond Fabrication has put its mark on the welding industry throughout Ontario and Canada. Blue Tide worked with Chris to create a new WordPress website design that was unique and the right fit for this established Ontario welding shop. Using a clean, fast-loading layout, the Diamond Fabrication WordPress website gives Ontario welding clients an engaging easy to use and find website to access. 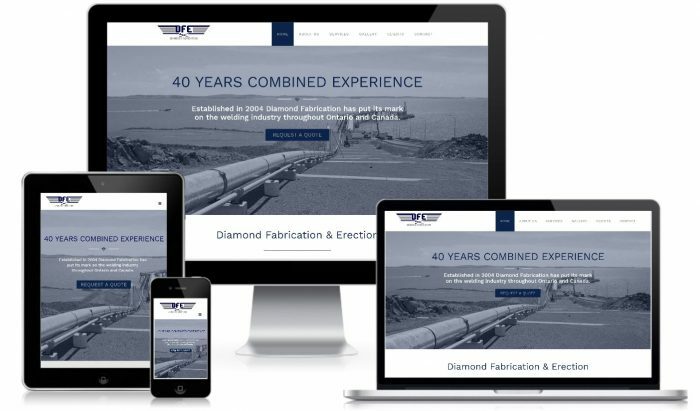 Considering a new website or website redesign for your welding shop or custom fabrication company? Call us today to look at website design options, traffic generation for your type of business, local SEO or Adwords Management. Text or call 416-889-7812 or use our contact form.